Michael McFadyen's Scuba Diving - Maritime Reefer The Maritime Reefer is a wreck that is located on the western side of Rarotonga, the main island of the Cook Islands. It is found south-west of Black Rock. These rocks are (as far as I can see) the only major outcrop of rocks on the shore's edge of the whole 34 kilometres of the island's circumference. This site is about 11 minutes from Avatui Harbour. I have checked the Lloyd's Register for the period 1960 to mid-1970s and have found no reference to a vessel by this name. Likewise, there is no entry in Lloyd's Casualty Returns for 1968 to 1983 nor is it mentioned in the index to the World Ship Society magazine Marine News for 1966 to 1979. If anyone has any real information about the ship I would appreciate it being sent to me. The ship appears to be a fishing vessel of about 40 to 50 metres. It has some refridgerated holds and a diesel engine. Dive Raratonga claims that the vessel was sunk by them in 1981. However, as the current owners of that operation are, as far as I know, many times removed from any owner in 1981, I am not sure that this is true. 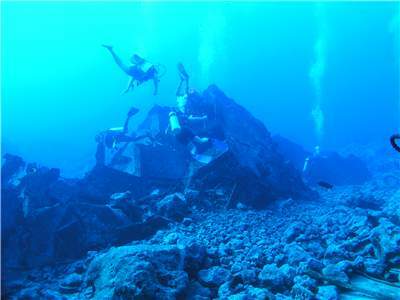 The operation I dived with, Cook Island Divers, has been the longest in operation as far as I know and they did not know how it got there. The anchoring spot is identified by a buoy which is about 30 to 50 metres off the fringing reef. The depth at the anchoring spot is about 12 metres. The wreckage starts right near here and as you head west from the anchor you drop to 26 metres and into a wide gully. More wreckage is seen and then the main wreck is seen. It is about 50 to 60 metres from the anchor spot to the wreck. The Maritime Reefer is broken into two main pieces. The first you will see is the stern section which is facing north-west. This is lying on its port side at about 45°. The first thing you will notice is that the single prop is bent back at a dramatic angle. This seems to indicate that the engine was running when the ship hit the reef and the prop was bent while the ship attempted to get off the reef. The rudder is in place. This part of the wreck contains the engine and you can see two of the refridgerated holds at the other end (you can see the cooling pipes). The bottom of the hull appears to contain coral. I could not determine if this was ballast or just pushed into the wreck by the numerous cyclones that hit the island in 2005 (five cyclones in five weeks) or earlier. 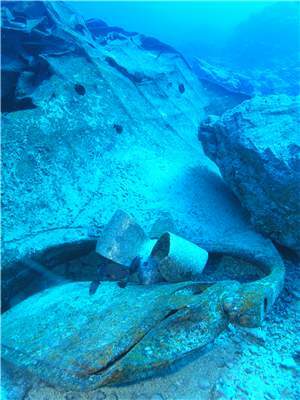 A few metres away is the bow section of the wreck. This is lying in the opposite direction on its starboard side, also at 45°. The rear section can be entered, although it is not very large. Again, the coral around here is not very good. I estimated that there was only about 10% live coral. I also saw no sponges at all and not even a tiny gorgonia (let alone a huge one like seen in many South Pacific Ocean countries). There were some blue, yellow and pink Christmas tree worms in the coral, one of only a few locations that we saw them. We saw one spotted eagle ray and some surgeonfish, trevally and triggerfish. The one good thing about this dive was the visibility, in excess of 40 metres. Water temperature in June was 24.0° and air temperature 23-25°. Thanks to Frances Prentice, Senior Librarian of the Australian Maritime Museum for assistance in trying to find information about the wreck.